Hi! My name is Cassandra. I live in Toronto, Canada with my husband Anson. I am an avid reader, fledgling gardener, and pop culture nerd. I was raised in the antiques trade with parents who were full time antique dealers. I spent a good portion of my childhood driving through Ontario and Quebec to search old barns and stores packed floor to ceiling with great old stuff. With this background it’s no surprise that I returned to antiques and vintage as a collector. My particular areas of interest are Canadian folk art, antique country furniture, McCoy and Vernonware pottery, vintage RCMP, Tiki, Pez dispensers and vintage linens. I like my home to have colour, comfort, and personality. If I can repurpose or salvage an old item even better. I am one of the founders and managing director of the antiques, art, and vintage selling website Collectivator. You should check it out! I am very proud to have a group of high quality sellers offering some of the best antiques and vintage on the internet. If you’re feeling friendly, you can follow Collectivator on Facebook, Twitter, and Pinterest too. 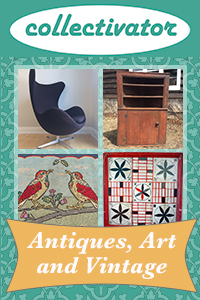 I hope that this blog will help encourage and educate people new to buying antiques. It can be intimidating to get started, but there is so much out there that will add charm and character to your world. Find what makes you happy! Question? Comment? Heaps of praise? Contact me by email: cassandra@collectivator.com. Can I buy the items you show on your blog? Items for sale through Collectivator will have links, and contact information for shops will be provided if I have it. Otherwise, I don’t sell the items from my personal collections that I show on this blog. Whenever possible I try to give ideas on where you can find similar items for yourself. Want to buy my McCoy pottery / Vernonware / other thing you collect? I’m happy to hear if you have an item to sell, but please understand my small budget and small house usually force me to say no. Also, if you do have something to sell, please give me a price. Why don’t you write about my business? If you have a shop, market or show you think I should check out, send me the details. If I am able, I am happy to visit new places and write about them. Can I repost parts of your blog? Parts, yes, but not word for word the whole thing please. If you want to use a small excerpt, or photo, go ahead but please give me credit and a link to my original content. This is the practice you will see I follow on any of my educational articles where I used other people’s blogs for research. It’s not just copyright, it’s classyright. Thanks for stopping by and I hope you enjoy the site!